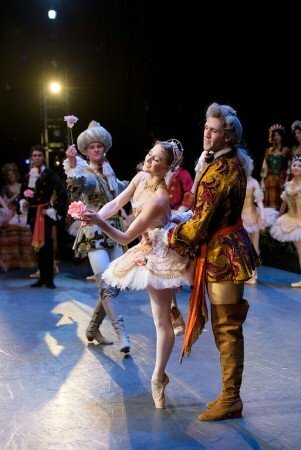 After a hiatus of four years, The Sleeping Beauty has returned to Boston Ballet. Taking the starring role twice in two weeks, Ashley Ellis was unremittingly stunning as Aurora, not only in terms of athletic feats, such as the balances of Act I, but also in the subtlety of her interpretation. Time and again she revealed depths of meaning in the choreography, by Petipa with additions by Ashton, that I had not appreciated before. To paraphrase Elizabeth Barrett Browning: How did I love these performances? Let me count the ways. In the Rose Adagio of Act I of this production by Ninette de Valois (after that of Nicholas Sergeyev from 1939), Aurora does a series of renversés – a move in which the body, following the arms, twists one way and then the other in a full circle. Even as the music swells into a majestic crescendo and Aurora enacts the excitement of celebrating her birthday, these spiral motions seem to indicate that she is being moved by forces beyond her control – as if she’s caught in a whirlwind. It goes without saying that Ellis was in complete control, but the illusion is that Aurora is being buffeted by something more powerful than she, which is exactly the case. Although Aurora is unaware of it, at this moment Carabosse is determining her future. Aurora is about to prick her finger on the spindle as was foretold at her christening and enter into a 100-year sleep. By performing the renversés with such intensity, Ellis made them into foreshadowings of the spell that is about to befall the princess. As such, I found them tremendously poignant. That poignant quality returns in the Act II vision scene when Aurora twice freezes in position (standing with one arm over her head and the other rounded in front of her) and then gradually recovers. These moments are much like the one in Coppélia when Swanilda transitions from automaton to human being, and embodies the difference between stasis and mobility, paralysis and animation. The ostensible purpose of the freezes in The Sleeping Beauty is to alert the prince to Aurora’s plight so that he will be moved to rescue her. More profoundly, as she emerges from her state of suspended animation, she personifies the joy that comes from the simple acts of breathing and moving. In Ellis’s highly nuanced transformation one saw a statement about the value of life itself. As the freezes melt away we also see a recapitulation of Aurora’s actual awakening when the spell is broken and she opens her eyes for the first time in a century, connecting with the world again. It is no less than a resurrection, and Ellis made us feel its emotional resonance. Similarly, two moments in Act III took on enhanced significance as Ellis performed them. The first was Aurora’s rising from floor in the grand pas de deux. Although most companies other than the Royal Ballet do not follow this tradition, Margot Fonteyn performed the movement very slowly and with apparent effort, so that she seemed to be reliving her return to life. Ellis’s posture as she rose was more upright than Fonteyn’s, but she still managed to convey the story by keeping her head down a bit and stretching out the timing of her ascension. In her Act III variation Aurora recounts the tale again through the circling port de bras of the final diagonal in which she raises her arms and head incrementally until, with arms on high and eyes scanning the heavens, she ends in a position of triumph. “I have experienced great sorrow,” she seems to say, “but I have survived to celebrate this glorious day of love and reclamation.” Ellis’s radiance made the message unmistakable. If Aurora’s affect was perfectly readable, the mental state of Eris Nezha as Prince Desire was a bit of a conundrum. He could not relax for most of the performance, and it was only after he finished his two Act III variations (very well, I might add) that he allowed himself to smile. I wish he had used those blue eyes of his to show a little love to his partner. All he needed was confidence; his competence was obvious. Other notable performers in the cast included Roddy Doble as the French prince in Act I. This is a supporting but non-dancing role that Doble made memorable because of the way he mirrored Aurora’s emotions. When she looked serious, his face registered concern, when she brightened up, he seemed to bask in the glow of her happiness. In addition, Ji Young Chae as the Songbird Fairy was delightful. She is extraordinarily good at youthful, joyous roles that create a kind of winking relationship with the audience in which she intimates, and we concede, how adorable she is. Kathleen Breen Combes as the Lilac Fairy displayed her usual upper-body expansiveness, but it didn’t appear as if she brought any new insight to the role. The rest of the fairies in the Prologue were good, but not great. It seemed as if they all could have used more time to perfect transitions and details. This also applies to Carabosse, who is new to the role and has time to grow into it. Irlan Silva as Bluebird delivered a masterful performance, with beautiful lines and powerful elevation. As his partner, Princess Florine, Anaïs Chalendard was a congenial presence if no match for great Florines of past generations, such as Antoinette Sibley. In the Act III pas de trois, Maria Baranova and Diana Albrecht were both impressive. Baranova is more deliberate and expansive — a regal dancer. Albrecht is a little quicker, with a real desire to communicate with the audience — a true charmer. Marcus Romeo was the prince’s tutor in Act II, and even in non-dancing roles, he stands out as an actor. In the same act, Boston Ballet student Noah Parets was wonderfully animated while engaging his fellow peasants in conversation, and when he danced the Farandole, his head was in such perfect position at all times that he made the other men look half-hearted. Music Director Emeritus Jonathan McPhee was back at the podium, and the music was sensational. The two big crescendos in the Prologue nearly brought me to tears. When hearing the music from the mezzanine I once again found that the electronic enhancement makes it too loud, but when I was seated on the orchestra level, it could not have sounded more sublime. Kudos to Maestro McPhee and the musicians of the Boston Ballet Orchestra who supported Ellis in creating an Aurora whose magnificence will stand the test of time.